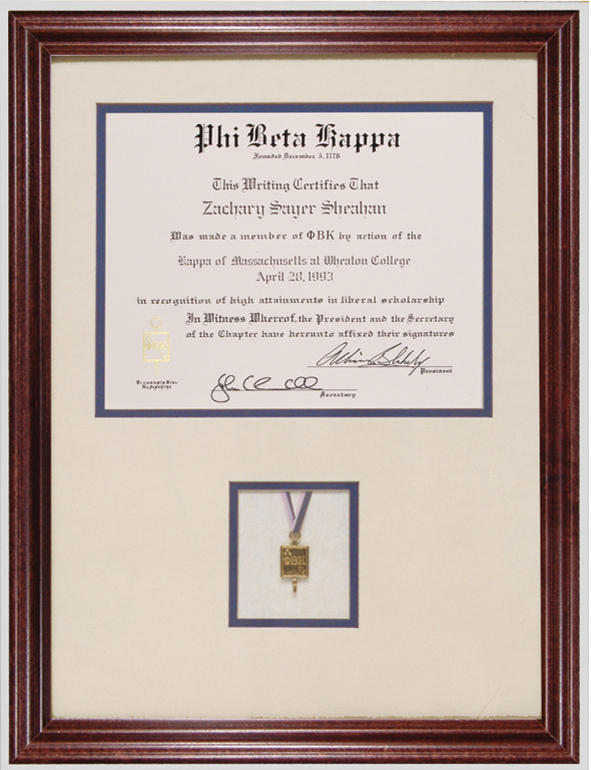 The Framed Membership Display includes engrossed certificate & large gold electroplate key, double matted in a walnut frame, 12" x 16" in size. 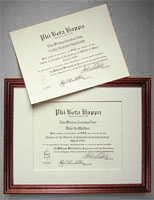 All certificates, printed on heavy diploma parchment paper 8.5" x 11" in size, are engraved with the official name of the chapter, the member's full name and the date of initiation. 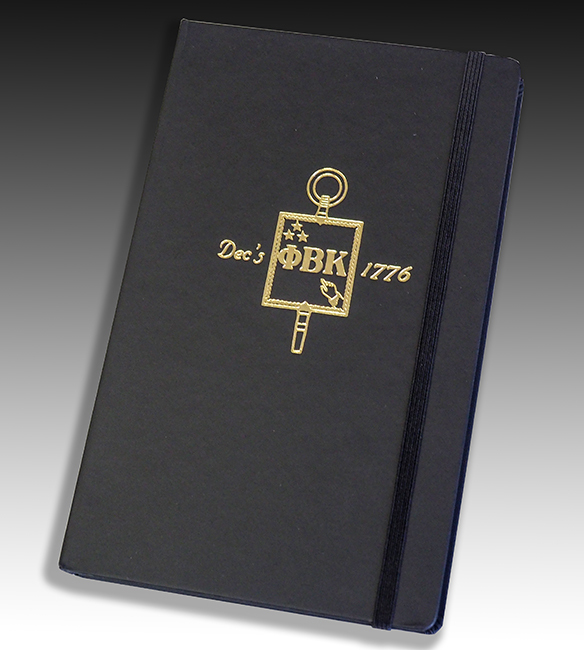 The Membership Certificate is printed on heavy diploma parchment paper 8.5" x 11" in size, and engraved with the official name of the chapter, the member's full name and the date of initiation. 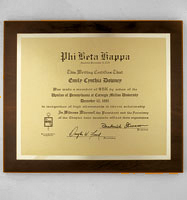 The Framed Certificate is matted with a walnut finish, 11" x 14" in size. 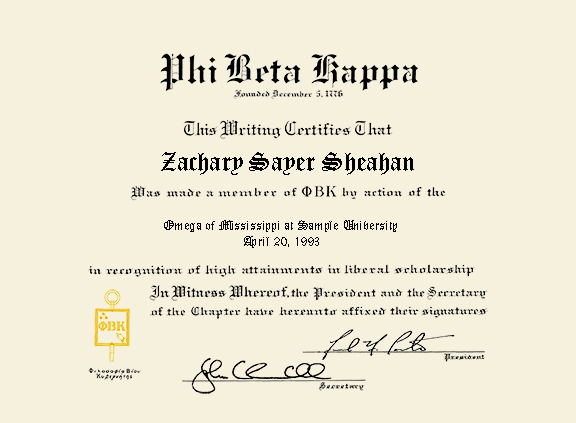 All certificates, printed on heavy diploma parchment paper 8.5" x 11" in size, are engraved with the official name of the chapter, the member's full name and the date of initiation. 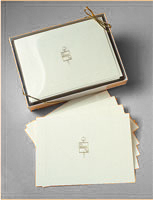 Engraved Phi Beta Kappa Notecards are informal cards, engraved in gold, folded with plain matching envelopes. Available in boxes of 20. This black leather portfolio is decorated on the front with a gold-leaf Phi Beta Kappa insignia. 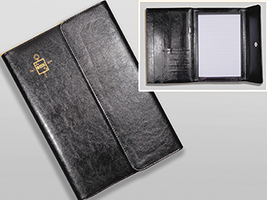 Inside there is a pad and lots of flaps to hold papers, pens and cards. 13 x 9 inches (closed) It is not personalized. 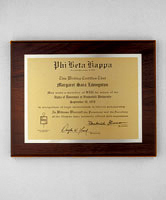 The Large Engrossed Wall Plaque is a metal facsimile of the membership certificate, made in gold toned stainless steel, mounted on a walnut base, 11" x 13" in size. 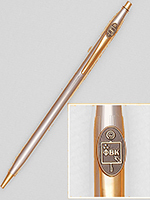 Allow four to six weeks for delivery. 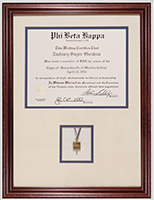 The Small Engrossed Wall Plaque is a metal facsimile of the membership certificate, made in gold toned stainless steel, mounted on a walnut base, 8" x 10" in size. 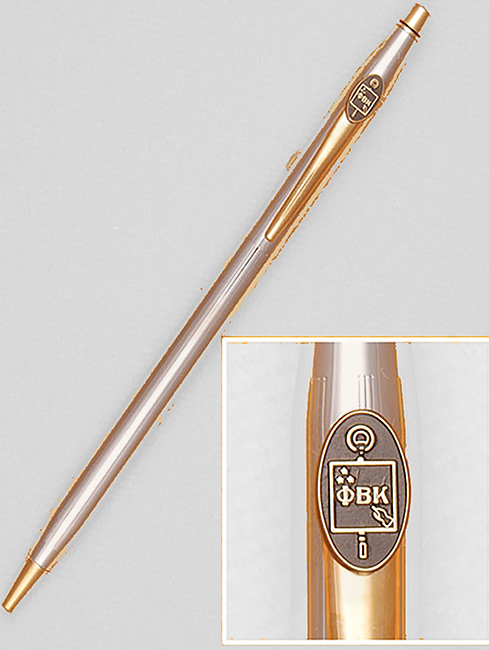 Allow four to six weeks for delivery. 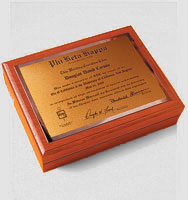 The Phi Beta Kappa Engrossed Box is solid cherry wood and bears a certificate plate on the lid. It measures 6 "x 7". Allow four to six weeks for delivery. 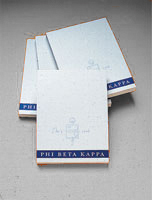 The Phi Beta Kappa Note Pads are 4"x5.5" in size and sold in packs of four.